There were two severe earthquakes off the coast of Gisborne in March and May 1947, each generating large tsunamis in the surrounding area. Run-up for Gisborne tsunami, 17 May. 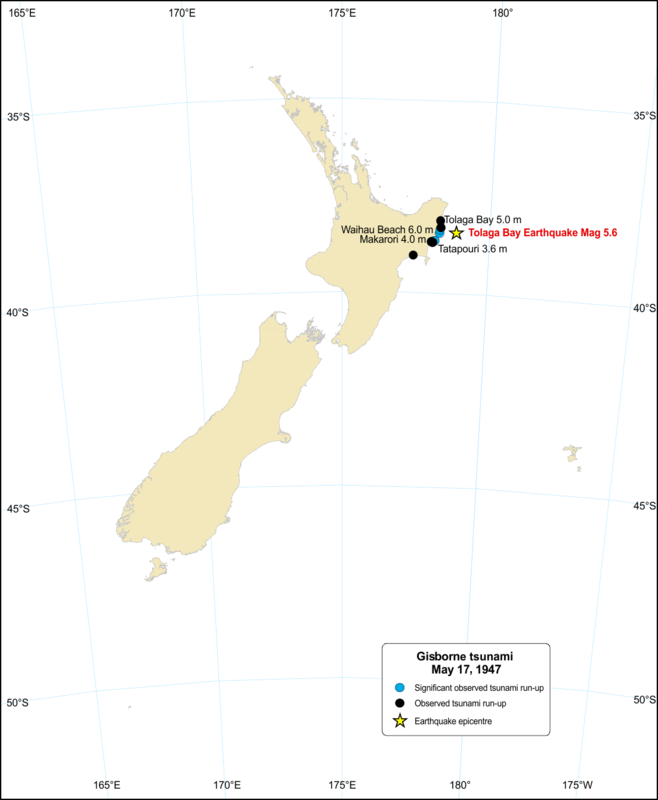 Another tsunami occurred in 1947, caused by the 17 May 1947 Mw 6.9-7.1 offshore Tolaga Bay earthquake. The tsunami was not well observed, as it occurred on a stormy winter night about half an hour after the earthquake, which was at 7:06 pm (about 1.5 hours before low tide). Nevertheless, its effects (damage, debris and inland water penetration) were noticeable the next day from Wainui Beach, near Gisborne, to at least Tolaga Bay, and possibly as far as Tokomaru Bay, spanning 50-80km of coastline. The greatest damage and height reached above sea level at the time (~6m) was at Waihau Beach, where logs piled ready to repair the bridge damaged in the tsunami two months previously were washed away. Here, the sea penetrated 400m inland up a creek, further inland and to a higher level than in the March tsunami. Water swept 50m inland at Tolaga Bay and the water height was estimated to be 1.8-2.4m higher than in the 26 March event. Taking the tide level into account suggests the waves may have reached 4-5m above sea level at the time.